Dear Michael, I hope you know that I was just kidding you about your Puppet Picture...I'm sure you realized that, when you arrived at our Broad Jam page and took a look at some of our pictures... LOL!! Love your song "Emperor Lane", sounds like the Beatles, Great Tune! Are you from the UK?? 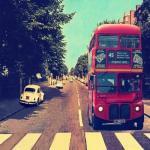 The photo of the Bus looks like a 60's picture from the film A Hard Days Night! Did you happen to take a listen to any of our tunes from our Broad Jam site yet?? The "Vampire" song is sung by a singer from the UK, a Keith Kallens, do you know him?? In fact, he sings on several of our songs! If you get a chance, we'd love to get your thoughts regarding some of our compositions?? Hi Hope you are well. Please check out my new song "Emperor Lane"